As soon as the Gophers men’s basketball team’s 11:15 a.m. Thursday tip-off against Louisville was announced, I thought: This is great! It’s the first of the “field of 64” games in the entire tournament, it’s televised on CBS and it will make for a great lunchtime rallying point on Thursday. And as a member of the media — even one who isn’t traveling for this game — I’m instinctively wired to root for early start times because of deadline pressure. Any game that starts before 6 p.m. his helpful. But before noon? The best. As it turns out, though, what’s good for ME isn’t necessarily great for Gophers fans who want to travel to support their team. Sure, the location (Des Moines) offers the ability to drive instead of flying — a savings for cost and maybe even time since a 3.5-hour drive to Iowa is faster than almost any flight when you factor in airport time. *Some fans are already there (the Gophers had an open practice today, where the above photo was taken) and will stay until Minnesota loses. But a lot of you are driving down Thursday morning and arriving just in time for the 11:15 a.m. tip-off. “Leaving dark and early at 5:30am on Thursday,” @Melissa_Berman wrote. *Melissa and plenty of others are also planning on coming back to the Twin Cities after the next game of the session is over (Bradley vs. Michigan State tips off 30 minutes after Gophers/Louisville, and the games are a package deal). That’s going to be a long day of driving and basketball. More power to you all, but that’s part of the hassle of a Thursday game. 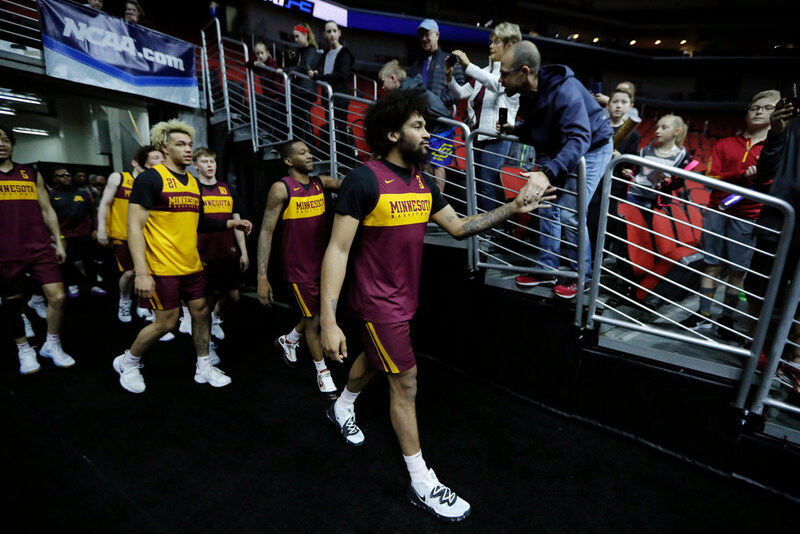 If the Gophers had earned a Friday slot — and if fans had to fly to get to their site — my guess is more people would at least be planning to tentatively make a long weekend out of it in hopes of seeing the Gophers play twice if they beat Louisville. “Coming in hot on Thursday and leaving after regardless, only got the one day off,” @QuavoYoda wrote. But hey, at least doing it all in one day is possible. Back in my younger days, I might have demanded to ride shotgun for that whole thing. El Bait Shop, by the way, is a Des Moines establishment boasting 262 beers on tap. If you’re going to visit postgame before driving home, please do so responsibly. *Some of you, though, are staying put Thursday and hoping for an upset so you can make the trek Saturday with a Sweet 16 berth on the line. I don’t recommend more than a few drinks nor should any city — even one in a rival state — be burned to the ground. But the enthusiasm and optimism are palpable. *One lucky Gophers fan (@skolyghost) already lives in Des Moines. (Er, maybe that’s only lucky for a few days), while @gopherbones declares: “I plan on moving to Des Moines permanently.” I mean, that is one way to get around the logistics of this weekend. Just start a new life in Iowa. For a lot of the rest of you? Wave to each other on I-35 as the sun comes up and as the sun goes down.